Transformers 3D delivered total movie experience where it leaves you at awe for a couple of hours. Superb effects and great 3D shots are just two main things this movie has to offer. From a disappointing Transformers 2: Rise of the Fallen, Dark of the Moon saved Michael Bay's franchise and somehow impressed almost all its viewers with great visual but yet another shallow story line and plot. What is good about this movie is that it manages to capture the taste of its audience for adrenalin-pumping and near-the-edge of your seat scenes that were a mark of an enormous budget and production. I really admire how this movie survive the 2 hours running time by just giving enough reason to watch it more on 3D. Yes, you heard it right! This was just one of the few movies were you wanna actually see on a 3D without statements of wasting your money. With the addition of the New Leading lady, Rossie, fans might have not been that used to after Megan Fox's portrayal for the last 2 Franchise. But, hey, Rossie, is hot enough and an able actress for such Blockbuster film. I see their chemistry with Shia, although at some point, you could still think about Megan on the scenes. Some maybe disappointed with Michael Bay's direction and the way he handled the plot of the Dark of the Moon. But, its visual and action, are more than enough to somehow cover the loop holes and the confusions the story has to offer. But, it is far better with the second one. Confusion occurs on the first part that makes you wonder how was the Decepticons and Megatrons, involved in the Human landing of the moon. While at the latter, it will lead to you to some certain answers about their connection. It was just great to see incorporation of historical videos such as the Landing of the Moon in the 1960's. Characters maybe too loud at times but they still compliment with the whole film. With the presence of Tyrese Gibson and Josh Duhamel, this films just delivered its technical and visual standpoint. The film is still studded with emotions and meta humors. Just a right combination to save you from the next 2 hours. I just love the way how he do with the 3D Technology and the film's visual technicalities. I just think Michael Bay needs to focus on strengthening his story line and theme in order to convince disappointed fans that he is, Indeed, the Director of the New generation. 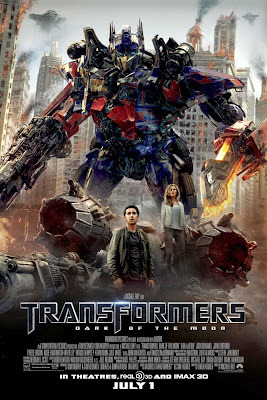 Transformers 3d IS JUST THE MOVIE TO BEAT in terms of 3D Technology and CGI effects.